A classic favourite with a twist! 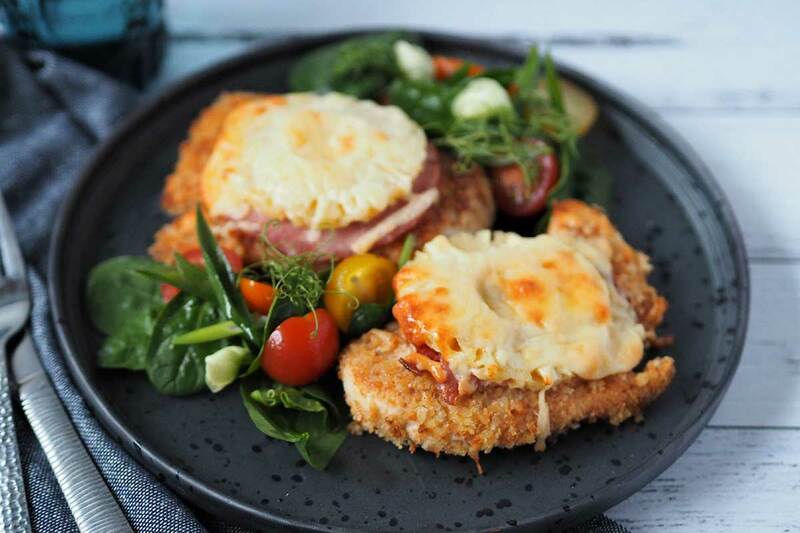 Everyone loves a chicken parmigiana, especially when it takes a Hawaiian holiday! LOL! Seriously though, this will be a hit with everyone you make it for. Related Product: Ghee, Coconut Oil, Tomato Sauce. Preheat oven to 200ºC and line a baking tray with baking paper. Beat your egg and place in a wide bowl/dish, in a second wide bowl/dish add flour and in a third wide bowl/dish add breadcrumbs. Fry off your chicken in a hot pan until cooked on each side. Don’t worry if the middle is still a touch undercooked, as it’ll finish cooking in the oven. Once your chicken is cooked on both sides, lay each piece on your oven tray. Top with passata sauce, ham, pineapple and grated cheese. Place in oven until the cheese is golden brown and cooked on top (approx. 15 mins).